The Philippine Embassy in Seoul invites all members of the Filipino Community to join the Itaewon Global Parade on Saturday, 13 October 2018 at 3:00 PM to 5:00 PM. 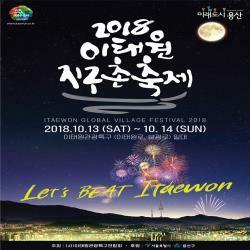 The Itaewon Global Village Festival, held every fall, brings together a fun mix of Korean traditions and foreign cultures and stands out as one of the most internationally diverse celebrations of Seoul. It is indeed a fantastic multicultural event where people learn about and experience different cultures. Members of the Filipino community who will join the parade are requested to come in their colorful Philippine traditional attire or Philippine festival attire. Assembly place is at Hangangjin Station at 2:30 PM. Please look for the three tents (waiting area) at Hangangjin Station. 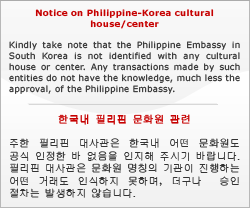 To confirm your participation and for additional inquiries about the Itaewon Global Festival Parade, please email [email protected] or call 02-796-7387 (ext.311). Let's all come together and celebrate Philippine pride!